It looks as though the St. Louis Cardinals have an ace in the making with Michael Wacha. The 19th pick in the 2012 draft, the starter rose quickly through the franchise's minor league ranks, making his major league debut about a year later. Although pitching prospects can be a risky venture in the hobby, collectors are quickly taking a liking to Wacha's dominant play. Michael Wacha rookie cards and his earlier prospect cards are on a fast upward trajectory, spurred on by strong late-season play and postseason heroics. He was named 2013 NLCS MVP as the Cardinals knocked off the Dodgers to reach the World Series. Michael Wacha rookie cards can be found in 2013 products. Because of his debut part way through the season, they come from late-season releases from both Topps and Panini. 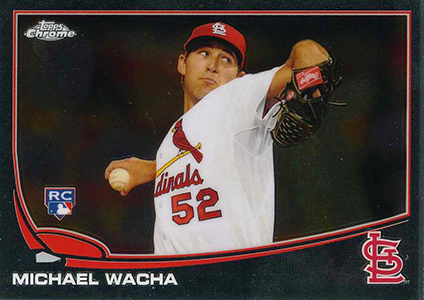 But the first Michael Wacha cards came out even before he was drafted by the Cardinals. 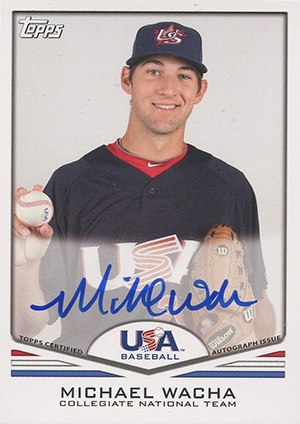 A USA Baseball alumni, collectors can find Michael Wacha autographs and memorabilia cards in a handful of 2011 Topps products featuring him as a member of the national team. 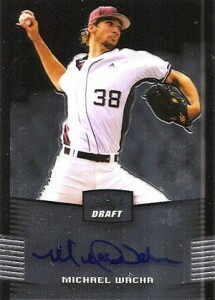 In 2012, Michael Wacha had plenty of prospect cards from Topps, Panini and Leaf. 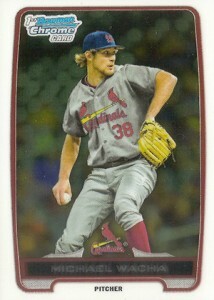 Bowman cards released by Topps picture Wacha in his Cardinals uniform. 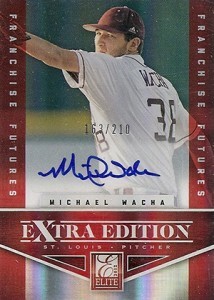 Below is a detailed look at all Michael Wacha rookie cards out so far as well as highlights of his top prospect cards. Click on the card name or image to shop for specific cards. Michael Wacha rookie cards are still being released. We'll continue to add to this list as more come out. 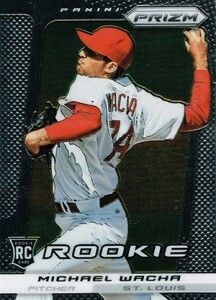 With a Bowman Chrome Prospect insert in 2012, it takes away some of the impact from Wacha's base set rookie. That said, there are plenty of Refractor parallels to add to the challenge. Panini's first Michael Wacha rookie card is similar to Bowman Chrome and Topps Chrome in that they're all based on chromium-style card stock. There is also plenty of color in the Prizm parallels. A clear shot and horizontal format make for a simple but attractive card. It's not going to be hugely valuable. For those looking for something a little pricier, Refractors come in many colors. Topps went all-in with their USA Baseball content in 2011 products. 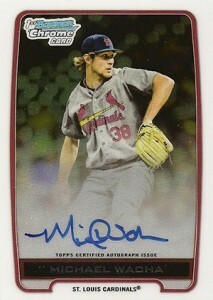 The 2011 Topps Chrome Michael Wacha autograph is one of his better early cards and comes with several Refractor parallels. That said, the sticker signature may be a turn-off to some. 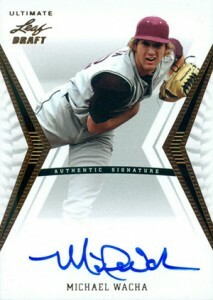 Although it's not as high-end as its Chrome counterpart, this autograph is hard-signed. Issued as a part of the 2011 Topps USA Baseball box set, it's still relatively affordable. 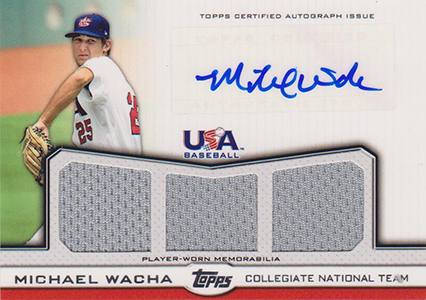 Numbered to 214, this is the first Michael Wacha autographed memorabilia card. It has windows for three jersey pieces, although most are generally on the plain side. It was also inserted in Topps' USA Baseball box set. 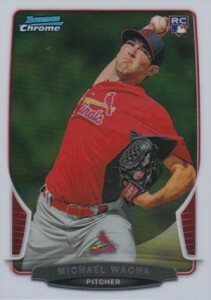 The 2012 Bowman Chrome Draft Michael Wacha is important for being the first to picture the pitcher in a MLB uniform. Although it's an insert by technicality, many collectors treat it (and its autographed counterpart) like rookie cards. If you're looking for the best Michael Wacha card, this is it. Shown in a Cardinals jersey, boasting an on-card autograph and carrying the Bowman Chrome name, it should be a must-have for anyone who is serious about collecting Michael Wacha cards. Not licensed by the MLB or MLBPA, Leaf's autographs are a little more affordable. 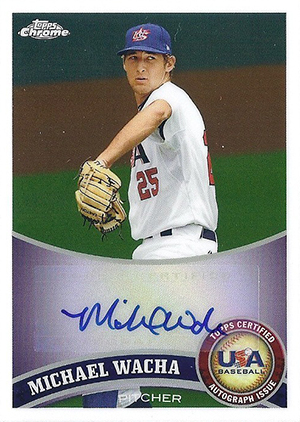 This is a good thing for those simply looking to add a Michael Wacha autograph to their collection. 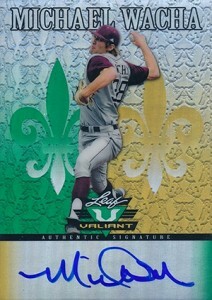 2012 Leaf Ultimate Draft falls under the same category as Wacha's Leaf Metal card. This card will appeal to those who don't care as much for chromium card stock. Instead, this has a more traditional white layout. The Leaf Valiant line is known for its nod at the old Donruss Crusade designs. It's colorful, shiny and hard-signed. But without the licensing aspect, it's still relatively affordable. The Elite Extra Edition name has a long history with prospectors. A more affordable alternative to 2012 Bowman Chrome, it has the advantage of being serial numbered.